Created by Sam Raimi the horror hero Ash first appeared in The Evil Dead in 1981. Ash was portrayed by Bruce Campbell and went on to feature in a further two films, Evil Dead 2 and Evil Dead 3: Army of Darkness. In The Evil Dead Ash was the only character to survive their encounter with the deadites while his girlfriend and mates are all killed. In Evil Dead 2 which is part remake, part sequel Ash returns to the cabin with a different girlfriend and battles the deadites again. 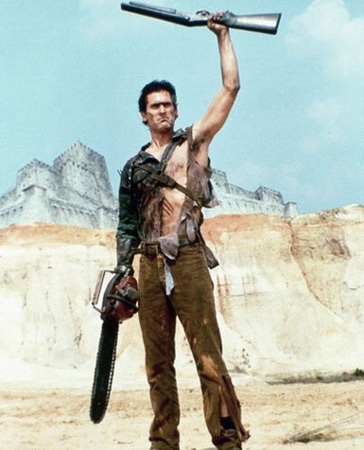 It is in the course of this film that Ash loses his right hand and replaces it with a chainsaw. Typically portrayed with his chainsaw as a right hand and a boomstick or sawn off shotgun in his left Ash is a wisecracking demon slaying nutcase. In the third film Ash is sent back to medieval times and must battle the deadites to retrieve the Necronomicon or Book of the Dead so he can return home. The film has various endings, one where he returns home and one where he oversleeps and ends up in a post-apocalyptic future. Ash is supposed to be a bit of a loser, his full name is Ashley J. Williams and he worked at a department store called S-Mart in the house wares department. It is only through his terrible experiences at the remote shack in the woods that he finds his true vocation as a demon slayer. Ash is an incredibly popular character and has made Bruce Campbell into something of a cult hero. The character has also appeared in a number of comic books and videogames over the years. It is very unusual for the hero of a horror film to become such a famous and well-loved character but Ash is no ordinary hero. Campbell is absolutely fantastic in the role, giving the best performance of his career and it is a shame that he never found another part so suited to his talents. There was talk of Ash appearing in the Freddy vs Jason film but Raimi decided against it. Campbell reportedly said he wouldn't do it unless Ash won. More recently there has been talk of a fourth Evil Dead film featuring Ash and there's simply no way anyone else can make this role their own, it has to be Bruce Campbell.